In case you missed it, this is one of the craziest rule infractions I've ever heard... and apparently even the rules officials got it wrong! 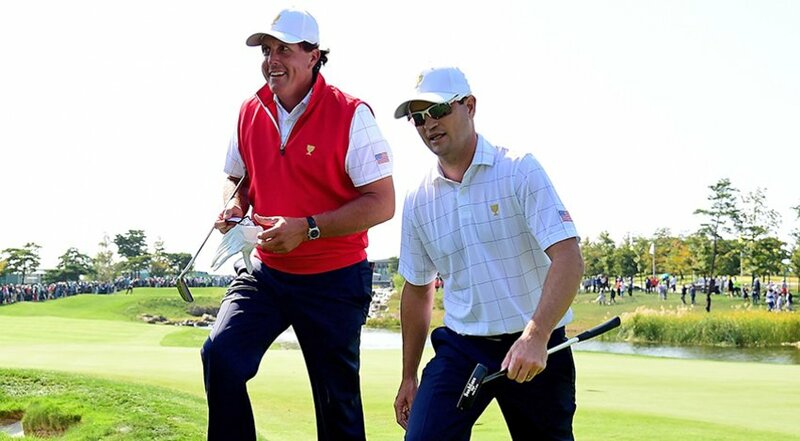 Here's the deal: The US team of Phil Mickelson and Zach Johnson are playing fourballs against the International team of Adam Scott and Jason Day. The teams are all square on the 7th tee. Then Phil tees off with a different type of Callaway ball, apparently to get more distance off the tee. It appears that this is legal in most of the matches. But according to the Captain's Agreement, this is a rules infraction in fourballs only that will result in an "adjustment" of the score at the end of the hole. Phil was apparently told -- incorrectly -- that he was DQ'ed from the hole so he picked up his ball and Zach finished out on his own. Zach lost the hole so Scott and Day go 1up. THEN the score gets adjusted... and Scott and Day are now 2-up. And once they tee off on the 8th, Phil can no longer go back and finish out the hole. As a result, Phil and Zach lost the same hole twice. And US Captain Jay Haas told GC that they were trying to find out exactly what Phil was told and whether that affects the ruling in some way, so rules official Mark Russell entered the fray. The matches continued, of course, but the momentum had changed as the International team appeared to flip another losing session into a winning one. I don't know that this one match was responsible for all of that, but I suspect it will get the credit. We humans like to have simple explanations for things, after all. And just to make things more interesting, even the live scoreboard at presidentscup.com didn't get the score correct. They never showed the 2up score. While I was writing that, Phil and Zach won the 9th hole and went to only 1down. The live scoreboard then showed that match all square... still incorrect. In the meantime, Phil and Zach got the match back to all square... and the live scoreboard was STILL wrong! And the momentum seemed to be changing again, although the International team still led the session overall. It's crazy rules like this that make golf incomprehensible to most people, even if they play the game. How did such a weird thing get into the Captain's Agreement in the first place? It seems to me that, since you can't make adjustments to clubs during play, you shouldn't be able to change the type of ball you use either. Rules should make the game simpler, not harder to understand. The irony of it all is that this could be the very thing that finally turns the Presidents Cup into a competitive match. Remember what happened after 'GimmeGate' at the Solheim Cup a couple of weeks back! The question becomes... who will finally gain that competitive edge? But given that Phil just holed out from a fairway bunker for eagle at 12 to put him and Zach back in front, I'm not so sure it will be the International team. Btw, as I finished up this post, the live scoreboard at presidentscup.com STILL hadn't got it right.